Mix all the ingredients together well and put into clean, dry jars. Made this way, it will only keep for 4-6 weeks. If you want to be able to keep the mincemeat for longer, use the following method. Mix all the ingredients, except the brandy, in an ovenproof mixing bowl and leave overnight in a cool place, covered with a cloth. Put the bowl, loosely covered with foil, into a very cool oven (110°C/225°F/Gas Mark ¼) for 3 hours until all the suet has melted. Remove the bowl from the oven and stir well. Leave to cool, stirring from time to time, so that the fat coats all the ingredients. When the mincemeat is quite cold, stir in the brandy and put into jars. Stored in a cool dark place, it will keep almost indefinitely. Rub the fat into the flour and sugar until the mixture is like fine breadcrumbs. Beat the egg yolk and milk in a basin. Add to the other ingredients and mix until the dough is smooth and firm, adding a little more milk if necessary. Leave to stand in a plastic bag in the fridge for at least 30 minutes before rolling out. This pastry is very “forgiving” and can be rolled out more than once. It has a wonderful light texture when cooked. Pre-heat the oven to 200oC/400oF/Gas Mark 6. Roll out the pastry thinly and cut into rounds with a pastry cutter. Line bun tins with the rounds and put a heaped teaspoonful of mincemeat in each. Top with a smaller round of pastry and bake for 10-15 minutes. Leave to cool on a wire tray and when cold dust with sieved icing-sugar. I just noticed you have posted your recipe, Perpetua. Thank you! This sounds so delectable. 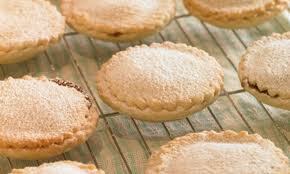 I will be saving your recipe for mince pies and see about making them. One tip about the pastry: if you don't have a use for the egg white, you can get a very nice result without the egg yolk by using just milk to mix the pastry. Not quite so rich, but still beautifully short. I welcome your comments and will always try to respond to them. Thank you for reading.